So yesterday I found all these really cool new blogs to look at and I came across a recipe for apple ginger muffins. I made them last night and they are sooooo yummy! I made 4 little bread tins instead of muffin tins. 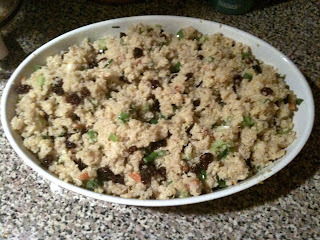 I also made a quinoa salad which I'll give you the ingredients for that is super delicious! p.s. 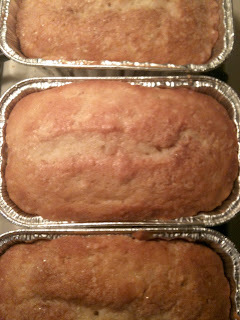 i always add sugar on the top of the batter before putting it in the oven. It makes the tops crispier and crackly. yum. Cook the Quinoa as per box directions and let it cool then mix in all that stuff and ta da! I just add things to my taste. Yay recipes! I am so making that bread. I'm gonna make something close to that salad I think. Ever tried quinoa pasta? yes!!! because I saw it on Top Chef! Now I use it all the time.